Best friends Snake and Lizard return with another collection of stories to help you reflect on the importance of an adaptable relationship between friends, and how necessary compromise is between people that matter to each other. Snake always wants to be first in all things, especially having his name before Lizard’s on the notice board advertising their help services. Lizard feels it’s time for a reshuffle of their partnership. He’s fed up with Snake’s bossy attitude. Democracy is a word bounced about, much to Snake’s distaste. Thankfully, their mutual ideals remain the same. 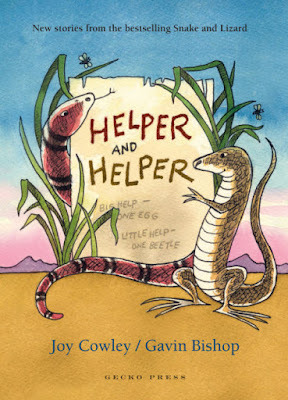 Helping others is their aim, and still at the set cost of big help, one egg; little help, one beetle. Although the two constantly bicker, they treasure their friendship, strange as it seems. There are times when Lizard’s constant prattle causes friction, and Snake wishes for quiet. When put to the test, he chooses sound over silence. When the pair’s livelihood is threatened by Doctor Grey Rabbit who has won over their clients, Lizard steps up with an unbelievable and clever suggestion to get them back. Highly entertaining is the hilarious episode of the message that becomes a Chinese Whisper. 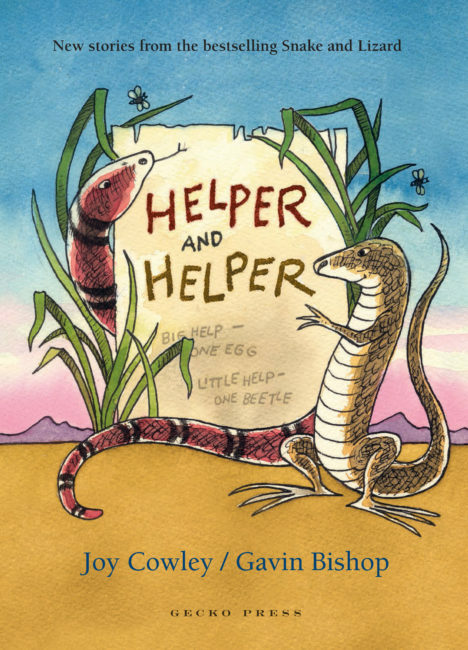 This third book about Snake and Lizard is again filled with adventures and challenges, mixed with competition for resources. The importance of community, and survival in the natural world, is also addressed along with family and sacrifice, and knowing when to say no. I love the duality of Joy Cowley’s stories which to me, always represent the thoughts, actions and emotions of humans and animals. Gavin Bishop instinctively brings Crowley’s text to life. His wonderful watercolour and pen drawings reflect the characters with astonishing accuracy.